The holidays are a time for friends, family, and, of course, lots and lots of food. 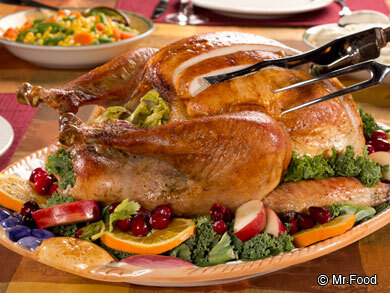 One food that's a real holiday staple is turkey! 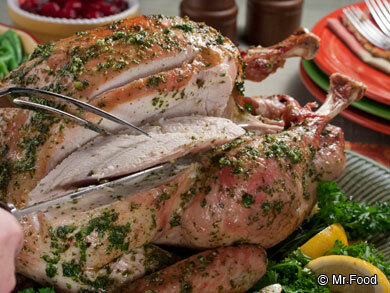 One of the questions we get asked most often is, "What's the best way to thaw a turkey?" Well, there are a few things to keep in mind when thawing a turkey, but once you know the do's and don'ts, you'll be whipping up your favorite recipes for turkey in no time at all! Defrosting a turkey doesn't have to give you brain freeze. Howard shows us two different ways of thawing a turkey, so you can cook a turkey no matter what time of year it is. 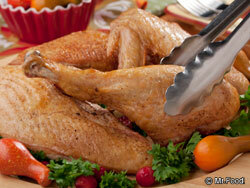 Check out our video and tips on how to thaw a turkey. Once you learn how easy it is, in no time at all, you'll be sayin', "OOH, IT'S SO GOOD! !®"
1. NEVER thaw a turkey at room temperature. 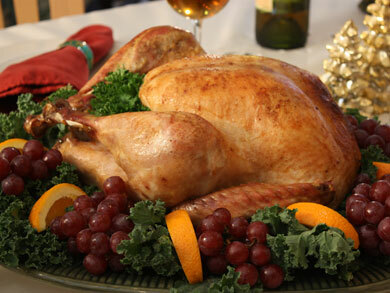 The turkey won't defrost evenly, and you will be at a higher risk of food borne illnesses. 2. NEVER cook a frozen turkey. We know you want to thaw a turkey fast, but cooking a frozen turkey just isn't a good idea. The turkey won't cook evenly, and you may end up serving raw pieces of poultry to your guests. 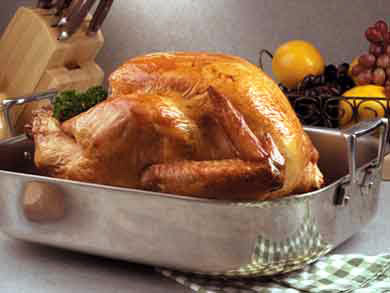 Method #1: Place your turkey on a rimmed baking sheet and defrost in the refrigerator. While your turkey defrosts, the condensation will pool up around it. Using a rimmed baking sheet prevents the water from making a mess in your fridge. Thawing a turkey in your refrigerator takes about 1 day for every 4-lbs of turkey, so if you want to defrost a 12-lb bird in the refrigerator, it will take about 3 days. Method #2: Place the turkey breast-side down in your kitchen sink and cover it with cold water. Yes, cold water. Placing a frozen turkey in warm water will begin to cook it partially, and that's not what we want (see number 2, above). Change the water in the sink every 30 minutes or so, replacing it with cold water every time. This method of thawing a turkey is faster than in the fridge: it takes about 30 minutes for every 1-lb, so thawing a 12-lb turkey in the sink will take about 6 hours. Now that you know how easy it is to thaw a turkey, why not try your hand at making some of these Thanksgiving turkey recipes? Plus, learn How to Carve a Turkey. I always put mine in the fridge to thaw. I always do the fridge method, it's very easy!!! This is excellent information and will probably make a huge difference to a lot of people, me included. I had never heard the time/weight equation before. This should help me plan my refrigerator use in the week before turkey-cooking days. I so look forward to Turkey every Thanksgiving.